Today’s new video uncovers a brand new fat loss food pyramid. In this 3 part series I uncover how you can literally maintain a fat burning environment round the clock 24/7. Just follow this quick tip and you’ll maintain high energy – fat burning environment from sun up to sun down. Speaking of 24/7, what if you could burn fat twenty four hours a day…every day? Do you realize how much faster you’d progress? How much more quickly the fat would melt away? How much more rapidly you’d have the body you want? And if you want to learn exactly how it’s done, then I have some great news for you. 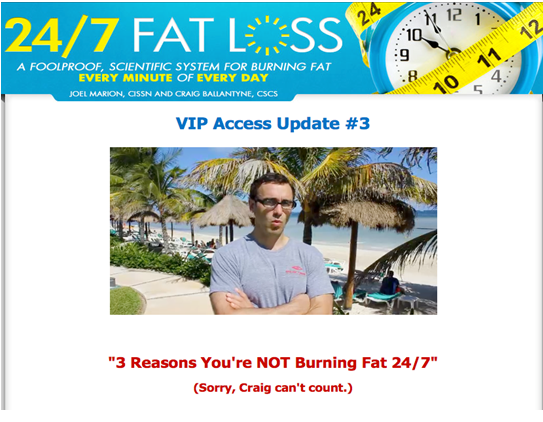 My buddies Joel Marion and Craig Ballantyne just posted a brand new article that reveals 3 MORE reasons you’re not burning fat 24/7. Just go here after watching today’s short vid and check it out their latest 24/7 Fat Loss VIP Access Update. You’ll see Craig (or should I say “Crabby Craig” haha) in his “protective crabby mode”. He’s really a great guy who knows hit shizat…he’s just a little shy on camera. Enjoy the fat burning goodness! Great content and even better “UofM” gear. Thanks Andrew! Good to see your name man. Hope you’re doing awesome. I LOVE this new way of thinking! I was eating small snacks all day with 1 lean and green meal-all combined to my 1000-1200 cals/day-but felt I was eating ALL day and never having time for it! I will incorporate this way of eating today and look forward to the following 2 segments to this!! I’m so close to my goal-and I am betting this will push me there! Thank you!! I love the idea of every 3.5 to 4 hours but really don’t see how I can get in 4 meals and still not eat 2 to 3 hours before bed time. Do I compromise on # of meals or eating before bed time? You can eat an hour before bed if you want Steve…just make sure that it’s a protein, fibrous veggie and/or friendly fat based…unless it’s “post” workout…then you can still have a starch or fruit without any fat spillover. The other option is to place the 2 meals after your workout closer together because this is the one time of the day we should seek higher insulin levels because it’s a ‘storage’ hormone and it will force/partition nutrients into muscle tissue. This gives you a couple options to solve your dilemma….